CCT5 was the first time that the Baron participated in an online tournament and from the seeding I understood that it would be one of the large group of outsiders. Nonetheless I was hoping for a nice result. But opposition was tough. The first game against Movei was very equal until Movei allowed the Baron's rooks (pigs according to IM Schroer) to reach the 7th rank. The game was over soon after that. The next game against Yace started promising with a kingside attack by Baron. Unfortunately the attack was easily defended and Yace pushed back on the queenside. Yace was successfull. The fourth game against Zappa seemed to be over quickly but Zappa was defending the tactical shots Baron fired on it. I saw Baron attacking after a not so good opening phase by Zappa. Baron sacrificed a pawn and got a major attack on the black position and I was quite surprised (like the author of Zappa) that Zappa survived. Remaining was a rook endgame where Baron had one pawn more. and the remaining pawn endgame is a simple win. I'm not sure if Baron could have won after a different move in the diagram position. The sixth game was a walk-over ... by Ruffian. In the seventh game Butcher was grabbing the initiative and launched a promising kingside attack after a strange move by the Baron (which I have to examine further). But the attack failed soon and Baron was able to take over, winning a pawn. Baron created a passed pawn which decided the game. The eighth game featured a KR+7p against KR+7p closed position. Baron's pawn structure was better, so it tried to break Aristarchs position. 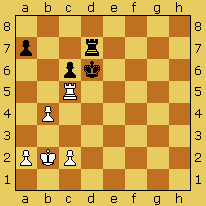 Both programs managed to get a rook into the enemy position which dealt with a lot of pawns. Although Baron ended up with one pawn more, the position was very hard to win, and dangerous to push for the win too. Both engines did great in going for a draw in the end. I enjoyed myself in watching the games and hope there will be a CCT6 soon.